Northerners get more than their fair share of bad press, with some think tanks writing off whole cities and Boris Johnson casually besmirching one city in a single sentence. This is usually done by those who never set foot much further north than Watford and who think we all live in an industrial and cultural wasteland, eat pies, vote Brexit and keep coal in the bath. St. Helens, where 58% voted to leave the EU is on the face of it a typical working class northern town, and on a night when the local rugby league team ‘the Saints’ were at home, the pubs and streets were full of men, sporting their team colours and excitedly discussing their team prospects (it ended badly with a defeat by Leeds). 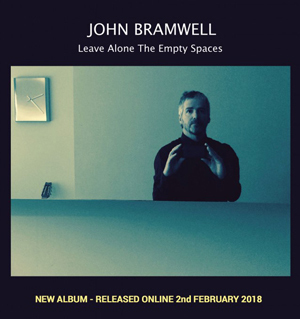 Enter Mancunian John Bramwell, former frontman of I Am Kloot, right at home in the murky atmosphere of the St. Helens Citadel and on brilliant form on his latest tour to promote his new solo album – Leave Alone the Empty Spaces. Unmistakeably northern in style and accent and cheeky banter he was truly captivating, not because of this but due to the poetry of his thoughtful, often melancholic lyrics and superb acoustic guitar playing that seem to encapsulate everything you might associate with the north in a ‘Heathcliff and Wuthering Heights foggy landscape’ kind of way. I think you have to be in a meditative state of mind to really appreciate the emotion and honesty of his lyrical and colloquial style, as the prose and the verbal skill in how he strings his idiomatic songs together touch your very soul and casts you in a spell. On tour with and occasionally supported by fellow singer and guitar player Dave Fidler, and pianist and accordionist Alan Lowles, they knocked out the classics from his impressive back catalogue, introduced some new ones from the album and played some as yet unreleased songs to an appreciative audience who engaged him in some lively banter throughout the evening. I saw the great I Am Kloot play several years ago at the Liverpool Academy, and I was sorry to hear they had split, as often happens, so I was unsure how John would fare on his own. But I have to say, I thought his acoustic versions of old classics were amazing and every one of his new songs sounds like a hit to me. Just not sure why this band and John Bramwell are not bigger than they are, they really deserve to have a place in not just northern musical history but worldwide. Maybe the northern influence is something that is only really appreciated by those of us who live here and have that affinity with the geography, history and the people that John so perfectly generates in every breath, word and note. Tennyson wrote that the North is 'dark and true and tender', as is John Bramwell – go see and wonder why the best music is created in the North. For full listing of live tour dates, go to http://www.johnbramwell.com/live-dates/.